Plot Blue is one of the very best stallions in the world. Ridden by Marcus Ehning the currently retired 19 years old stallion succeeded on the very top level of show jumping – Ehning and Plot Blue won the 2009 European Team Bronze, the 2010 FEI World Cup Final and a World Championship Team Gold in 2010. 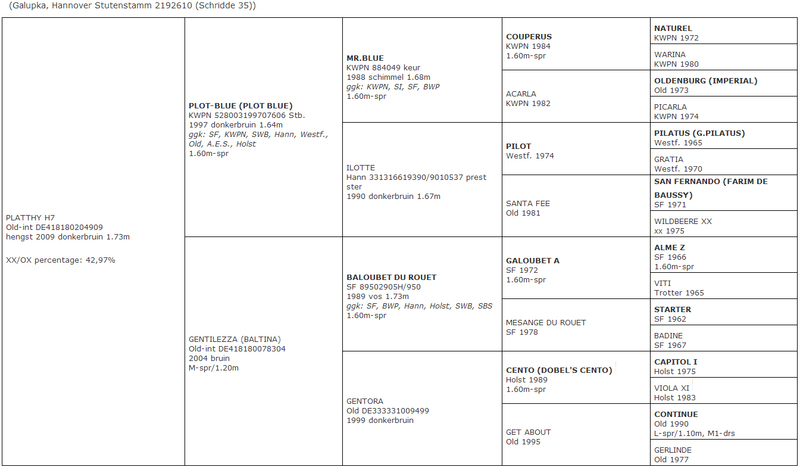 Fully proven as a competition horse, Plot Blue is also a highly valued sire approved in the Holstein, Selle Francais, KWPN, SWB, Hannover, Westfalian, Oldenburg and A.E.S. studbooks. Platthy H7’s dam currently competes at 1.35m level under the Olympic rider Soon-Won Hwang. Baltina’s father Baloubet du Rouet is simply the World’s Number One: Already at the age of seven he became French Champion in show jumping, later he won the World Cup three times in a row with Rodrigo Pessoa and in 2014 they also became Olympic Champion in Athens. Baloubet du Rouet is also incredibly successful as a sire: in 2012 and 2013 he was the leading sire of the WBFSH ranking for show jumping horses. Baltina’s oldest brother Chips (from Come On) is an internationally successful 1.60m jumper ridden by the 2012 Olympic Champion Steve Guerdat. Baltina’s younger brother Tailormade Bacento (also from Baloubet du Rouet) is currently at 1.35m.